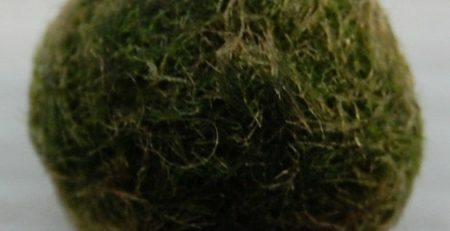 Their fun shape, movement, and minimal care requirements make marimo moss balls an attractive addition to plant bowls and freshwater aquariums. 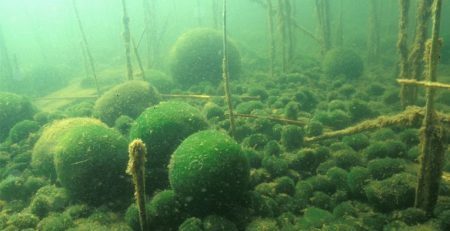 Not actually a moss, marimo balls (Aegagropila linnaei, also known as Cladophora balls and lake balls) are rare spherical-shaped, noninvasive algae with a velvet-like appearance. The species are native to Lake Akan in Japan, where they are designated as a national treasure and believed to bring good luck. Also found in parts of Europe and Iceland, they are considered endangered and are protected in both Japan and Iceland. 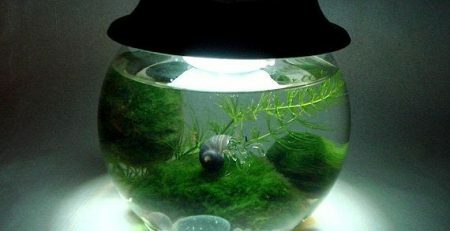 Domesticated marimo balls are very easy to maintain and ideal for beginners. They can live with all types of fish, and are perfect for low-stocked and low-tech aquariums. No food or fertilizers are needed since they create their own food through photosynthesis. It’s okay to use fertilizer for other plants in the tank, which may promote faster growth. 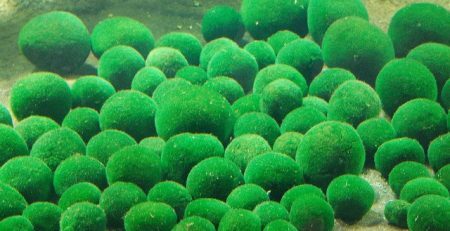 Marimo balls grow slowly: up to 5 mm per year, eventually reaching 2 to 5 inches in aquariums, or 8 to 12 inches in natural conditions. Wild marimos live in cold, dark waters where the waves slowly turn them to expose all sides to the light. Indoors they need to be kept in clean, cold water with low lighting. Every one to two weeks, change the water and gently rinse them to remove any accumulated debris. It’s fine to use tap water. The temperature should stay below 77°F (25°C). Place the balls in low indirect sunlight or low artificial light. Avoid direct sunlight, as it will burn and possibly kill them. 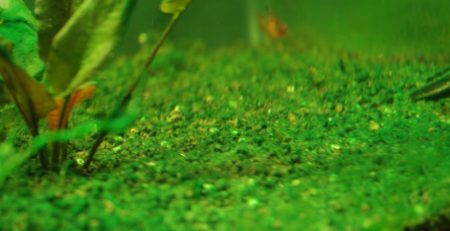 Waterlogged marimo moss balls will stay at the bottom of a tank, but otherwise they float to the top or move up and down. It’s important to keep their surface clean and evenly exposed to the light. If you see one on the bottom of the tank or with an “unhealthy” brown spot, gently turn it once a week so the light reaches any unexposed sides. 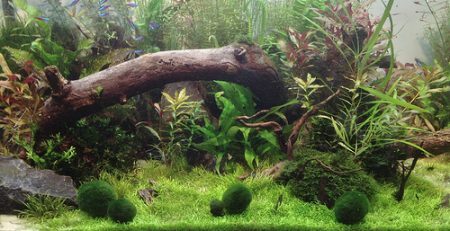 Larger balls can be divided or may grow baby balls that later detach, creating a small indoor marimo ball colony. 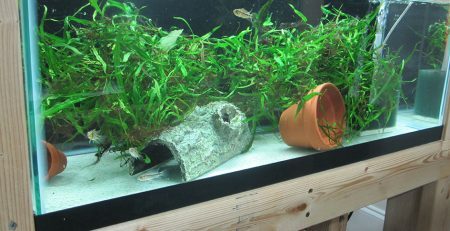 With the right environment and cleaning routine, marimos can live many years and even be passed from generation to generation as a unique living keepsake. Will live and grow best in cool water below 77°F (25°C). If the temperature is too hot, they can be placed in the refrigerator for up to 48 hours but will not survive in the freezer. 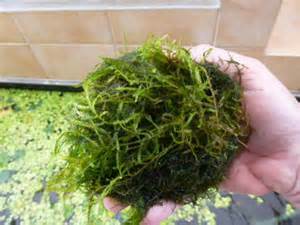 Change the water and clean marimo moss balls every one to two weeks—more often in summer and less often in winter. For plant bowls, replace all of the water with new tap water. For filtered aquariums, replace 25 percent of the water with new tap water. Marimo balls thrive when they’re clean. When changing the water, place them in a bowl of fresh tap water, gently squeeze to remove any dirt, then gently roll them in your hands and lightly tap with your fingertips to re-shape. 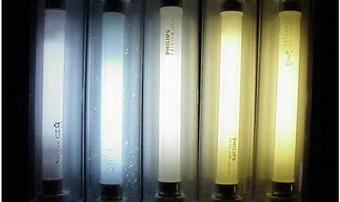 Keep in normal household lighting, low artificial light, or low indirect sunlight. Do not expose to bright light or direct sunlight, which will damage them. Can be kept in a covered or uncovered container. A cover will help keep the water clean. Division, either naturally occurring or re-shaped cuttings. They are extremely slow growing. 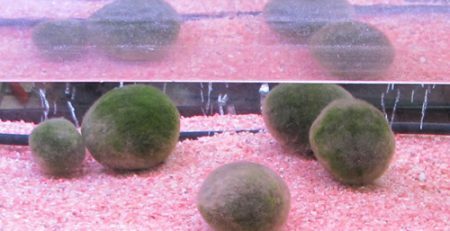 During natural division small lumps of baby marimo balls will appear and eventually detach. To divide a larger ball, gently squeeze out the water and cut it in halves or quarters. Resulting pieces should be no larger than 2 to 3 inches, so cut in half again if necessary. The exposed inner algae filaments need to face the light source to stimulate growth. Wait two days, then help shape the new pieces into spheres by (1) wrapping sewing thread around each ball in two directions, perpendicular like the ribbon on a gift-wrapped box, (2) placing the new balls in a round container/bucket and creating a gentle circular current, or (3) gently rolling the moss balls in your hands, which will take a lot of time and patience. Promote even growth and a nice round shape by turning them at least once a week.